Research investigators at Wayne State University in collaboration with La Jolla Institute for Allergy and Immunology (LJAI) are developing a T-cell peptide-based vaccine for cardiovascular disease, specifically, to reduce immune-based inflammatory plaques in arteries. The scientists published their findings in the December 2013 issue of Frontiers in Immunology, titled “Atheroprotective vaccination with MCH-II restricted peptides from Apo B-100.” These experiments show proof of concept for the development of an autoantigen-specific vaccine for reducing the amount of atherosclerotic plaques in mice. Atheroprotective Vaccination with MHC-II Restricted Peptides from ApoB-100. Front Immunol. 2013 Dec 27; 4:493. BACKGROUND: Subsets of CD4(+) T-cells have been proposed to serve differential roles in the development of atherosclerosis. Some T-cell types are atherogenic (T-helper type 1), while others are thought to be protective (regulatory T-cells). Lineage commitment toward one type of helper T-cell versus another is strongly influenced by the inflammatory context in which antigens are recognized. Immunization of atherosclerosis-prone mice with low-density lipoprotein (LDL) or its oxidized derivative (ox-LDL) is known to be atheroprotective. However, the antigen specificity of the T-cells induced by vaccination and the mechanism of protection are not known. METHODS: Identification of two peptide fragments (ApoB3501-3516 and ApoB978-993) from murine ApoB-100 was facilitated using I-Ab prediction models, and their binding to I-Ab determined. Utilizing a vaccination scheme based on complete and incomplete Freund’s adjuvant (CFA and IFA) [1 × CFA + 4 × IFA], we immunized Apoe(-/-)mice with ApoB3501-3516 or ApoB978-993 emulsified in CFA once and subsequently boosted in IFA four times over 15 weeks. Spleens, lymph nodes, and aortas were harvested and evaluated by flow cytometry and real time RT-PCR. Total atherosclerotic plaque burden was determined by aortic pinning and by aortic root histology. RESULTS: Mice immunized with ApoB3501-3516 or ApoB978-993 demonstrated 40% reduction in overall plaque burden when compared to adjuvant-only control mice. 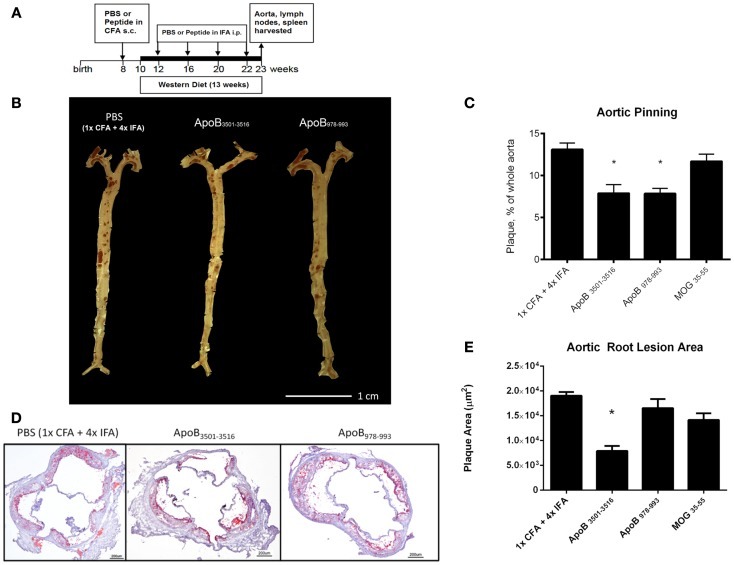 Aortic root frozen sections from ApoB3501-3516 immunized mice showed a >60% reduction in aortic sinus plaque development. Aortas from both ApoB3501-3516 and ApoB978-993 immunized mice contained significantly more mRNA for IL-10. Both antigen-specific IgG1 and IgG2c titers were elevated in ApoB3501-3516 or ApoB978-993 immunized mice, suggesting helper T-cell immune activity after immunization. CONCLUSION: Our data show that MHC Class II restricted ApoB-100 peptides can be atheroprotective, potentially through a mechanism involving elevated IL-10. Atherosclerosis is decreased in ApoB3501–3516 and ApoB978–993-treated mice compared to controls. (A) Vaccination schedule: 8-week-old female Apoe−/− mice were immunized once with either PBS or peptide in CFA, then boosted four more times with PBS or peptide in IFA. WD was maintained for 13 weeks. Mice were sacrificed and organs harvested at 23 weeks of age. (B,C) Results of aortic pinning analysis after Sudan IV staining are shown with representative photographs. N = 12–15 in each group, *p < 0.05 when compared to 1× CFA + 4× IFA group. (D) Representative aortic root staining sections after ORO staining, counter-stained with hematoxylin. (E) Plaque area from aortic roots stained from each group. Lesion sizes from 30 to 40 μm distal to start of the aortic valve were averaged per group. N = 5 in each group, *p < 0.05 when compared to 1× CFA + 1× IFA control group. Andreas Hermansson, DFJ Ketelhuth, D Strodthoff, M Wurm, E. Hansson, et al. Atherosclerosis is a chronic inflammatory disease in which lipoproteins accumulate, eliciting an inflammatory response in the arterial wall. Adaptive immune responses that engage clonally expanded T cell populations contribute to this process, as do innate immune responses that are mounted by macrophages and other cells. Several studies have suggested that components of low-density lipoprotein (LDL) particles trigger vascular inflammation (Tabas et al., 2007; Hartvigsen et al., 2009). As a consequence of oxidation, the double bonds of fatty acid residues in phospholipids, cholesteryl esters, and triglycerides are cleaved, thus generating reactive aldehydes and truncated lipids (Esterbauer et al., 1990). Among the latter, modified phospholipids, such as lysophosphatidylcholine and oxidized 1-palmitoyl-2-arachidonyl-sn-glycero-3-phosphocholine (ox-PAPC), induce endothelial cells, macrophages, and B1-type B cells to initiate innate immune responses, effecting adhesion molecule expression, chemokine production, and secretion of natural antibodies containing germline IgM sequences (Leitinger et al., 1997; Binder et al., 2004; Gharavi et al., 2007). Immune responses to oxidized low-density lipoprotein (oxLDL) are proposed to be important in atherosclerosis. To identify the mechanisms of recognition that govern T cell responses to LDL particles, we generated T cell hybridomas from human ApoB100 transgenic (huB100tg) mice that were immunized with human oxLDL. Surprisingly, none of the hybridomas responded to oxidized LDL, only to native LDL and the purified LDL apolipoprotein ApoB100. However, sera from immunized mice contained IgG antibodies to oxLDL, suggesting that T cell responses to native ApoB100 help B cells making antibodies to oxLDL. ApoB100 responding CD4+ T cell hybridomas were MHC class II–restricted and expressed a single T cell receptor (TCR) variable (V)  chain, TRBV31, with different V chains. Immunization of huB100tgxLdlr/ mice with a TRBV31-derived peptide induced anti-TRBV31 antibodies that blocked T cell recognition of ApoB100. This treatment significantly reduced atherosclerosis by 65%, with a concomitant reduction of macrophage infiltration and MHC class II expression in lesions. In conclusion, CD4+ T cells recognize epitopes on native ApoB100 protein, this response is associated with a limited set of clonotypic TCRs, and blocking TCR-dependent antigen recognition by these T cells protects against atherosclerosis. Xinjie Lu, Min Xia, V Endresz, I Faludi, A Szabo, et al. ► We produced 5 constructs using dendroaspin as a scaffold for immunization study. ► All constructs have the effect on lesion reduction. ► Modulation in atherosclerosis-related autoimmunity appears by Tregs. Atherosclerosis is increasingly recognized as a complex chronic inflammatory disease of the arterial walls ,  and , as evidenced by the presence of inflammatory cells, activated immune cells and cytokines in lesions, all of which indicate involvement of the immune system. Atherosclerotic plaques are known to contain macrophage-derived foam cells in which macrophages interact with T-cells to produce a wide array of cytokines that can exert both pro- and anti-inflammatory effects. Antibodies against aldehyde-modified ApoB100, a major constituent of low-density lipoprotein, reduce atherosclerosis in mice expressing human ApoB100, suggesting an immunogenic role of ApoB100. Antibodies against epitopes of the human heat shock protein 60 (hHSP60) molecule (hHSP60153–163: AELKKQSKPVT and hHSP60303-312: PGFGDNRKNQ) are present in atherosclerotic patients and share considerable homology with human cytomegalovirus (HCMV)-derived protein (immediate early protein UL122) and Porphyromonas gingivalis microbial HSP60. Sequence homology between microbial HSP60 and hHSP60 has been suggested to result in immunological cross-reactivity, which may play a role in atherogenesis. Titers of Cpn antibodies are not always positively associated with the Cpn organism in atheroma; however, these antibodies might exert cross-reactivity to non-Cpn antigens. Immunization of mice with a single construct containing multiple epitopes derived from ApoB100, hHSP60 and Cpn was more effective in reducing early atherosclerotic lesions through the induction of a specific Treg-cell response than was the construct containing either mono- or bi-epitopes. This approach offers attractive opportunities for the design of protein-based, multivalent vaccines against atherosclerosis. Xinjie Lu, Daxin Chen, Valeria Endreszb, Min Xia, Ildiko Faludi, et. al. were further supported by significant differences in the cellular and humoral immune responses between test animals. Conclusions: Immunization with a combination of ApoB and HSP60 peptide antigens significantly reduced early atherosclerotic lesions in the Apobtm2SgyLdlrtm1Her/J mouse model of atherosclerosis. This approach offers promise as a novel strategy for developing anti-atherosclerotic agents. ► C. pneumoniae infection increases the adhesion of vascular smooth muscle cells. ► C. pneumoniae infection promotes the migration of vascular smooth muscle cells. ► IQGAP1 expression was increased in the infected vascular smooth muscle cells. ► Depletion of IQGAP1 inhibits the infection-induced cell adhesion and migration. The mechanisms for Chlamydophila (Chlamydia) pneumoniae (C. pneumoniae) infection-induced atherosclerosis are still unclear. Cell adhesion has important roles in vascular smooth muscle cell (VSMC) migration required in the development of atherosclerosis. However, it is still unknown whether IQ domain GTPase-activating protein 1 (IQGAP1) plays pivotal roles in C. pneumoniae infection-induced the adhesion and migration of rat primary VSMCs. Accordingly, in this study, we demonstrated that rat primary VSMC adhesion (P < 0.001) and migration (P < 0.01) measured by cell adhesion assay and Transwell assay, respectively, were significantly enhanced after C. pneumoniae infection. Reverse transcription-polymerase chain reaction analysis revealed that the mRNA expression levels of IQGAP1 in the infected rat primary VSMCs were found to increase gradually to reach a peak and then decrease gradually to a level similar to the control. We further showed that the increases in rat primary VSMC adhesion to Matrigel (P < 0.001) and migration (P < 0.01) caused by C. pneumoniae infection were markedly inhibited after IQGAP1 knockdown by a pool of four short hairpin RNAs. Taken together, our results suggest that C. pneumoniae infection may promote the adhesion and migration of VSMCs possibly by upregulating the IQGAP1 expression. ► Rosiglitazone has a marked effect on both aneurysm rupture and development. ► Rosiglitazone modulates inflammation by blocking TLR4/JNK signalling. ► Specific antagonists of JNK and TLR4 may be therapeutic for aneurysms. Development and rupture of aortic aneurysms (AA) is a complex process involving inflammation, cell death, tissue and matrix remodelling. The thiazolidinediones (TZDs) including Rosiglitazone (RGZ) are a family of drugs which act as agonists of the nuclear peroxisome proliferator-activated receptors and have a broad spectrum of effects on a number of biological processes in the cardiovascular system. In our previous study we have demonstrated that RGZ has a marked effect on both aneurysm rupture and development, however, the precise mechanism of this is unknown. Methods and results In the present study, we examined possible targets of RGZ action in the early stages of Angiotensin II-induced AA in apolipoprotein E-deficient mice. For this purpose we employed immunoblotting, ELISA and antibody array approaches. We found that RGZ significantly inhibited c-Jun N-terminal kinase (JNK) phosphorylation and down-regulated toll-like receptor 4 (TLR4) expression at the site of lesion formation in response to Angiotensin II infusion in the initiation stage (6–72 h) of experimental AA development. Importantly, this effect was also associated with a decrease of CD4 antigen and reduction in production of TLR4/JNK-dependant proinflammatory chemokines MCP-1 and MIP-1α. Conclusion These data suggest that RGZ can modulate inflammatory processes by blocking TLR4/JNK signalling in initiation stages of AA development. Atheroprotective immunization with malondialdehyde-modified LDL is hapten specific and dependent on advanced MDA adducts: implications for development of an atheroprotective vaccine. Gonen A, Hansen LF, Turner WW, Montano EN, Que X,…, Hartvigsen K.
J Lipid Res. 2014 Oct;55(10):2137-55.
http://dx.doi.org:/10.1194/jlr.M053256. Epub 2014 Aug 20. Immunization with homologous malondialdehyde (MDA)-modified LDL (MDA-LDL) leads to atheroprotection in experimental models supporting the concept that a vaccine to oxidation-specific epitopes (OSEs) of oxidized LDL could limit atherogenesis. However, modification of human LDL with OSE to use as an immunogen would be impractical for generalized use. Furthermore, when MDA is used to modify LDL, a wide variety of related MDA adducts are formed, both simple and more complex. To define the relevant epitopes that would reproduce the atheroprotective effects of immunization with MDA-LDL, we sought to determine the responsible immunodominant and atheroprotective adducts. We now demonstrate that fluorescent adducts of MDA involving the condensation of two or more MDA molecules with lysine to form malondialdehyde-acetaldehyde (MAA)-type adducts generate immunodominant epitopes that lead to atheroprotective responses. We further demonstrate that a T helper (Th) 2-biased hapten-specific humoral and cellular response is sufficient, and thus, MAA-modified homologous albumin is an equally effective immunogen. We further show that such Th2-biased humoral responses per se are not atheroprotective if they do not target relevant antigens. These data demonstrate the feasibility of development of a small-molecule immunogen that could stimulate MAA-specific immune responses, which could be used to develop a vaccine approach to retard or prevent atherogenesis. Low density lipoprotein oxidation and atherogenesis: from experimental models to clinical studies. G Ital Cardiol. 1997 Dec; 27(12):1302-14. Oxidative modifications of low-density lipoproteins (LDL) (“oxidation hypothesis”) appears to be the pathophysiologic mechanism implicated in early atherogenesis. Oxidized LDL (ox-LDL) may also induce several pro-atherogenic mechanisms, such as the regulation of vascular tone, by interfering with nitric oxide, the stimulation of cytokines and chemotactic factors (MCP-1, M-CSF, VCAM-1, etc.) and transcription factors (AP1 and NFk beta). These phenomena complicate the spectrum of direct and indirect actions of ox-LDL. The immunogenicity of ox-LDL was used to generate monoclonal antibodies against many epitopes of ox-LDL, such as malondialdehyde-lysine (MDA-2) or 4-hydroxynonenal-lysine (NA59). These antibodies showed the occurrence of ox-LDL in vivo. Another issue is the role of the humoral and cellular immune system in atherogenesis, in particular whether the immune response to ox-LDL enhances or reduces early atherogenesis. Moreover, the induction of autoantibodies against ox-LDL and the recognition by “natural” antibodies, and the use of the antigens to screen human sera may serve as a marker of atherosclerosis. In this review, we have stressed the importance of methodologic approach in the assessment of LDL-oxidation and the fact that lipoprotein (a) may also undergo oxidative modifications. Several clinical conditions are associated with increased rate of LDL-oxidation. Recently, we have observed the presence of LDL oxidation-specific epitopes in human fetal aortas. Antioxidants studies in primary prevention of atherosclerosis have produced contradictory results. This may be explained in part by the selection of patients who had advanced lesions and were often smokers. New trails suggest that antioxidants be administered early in children. Lastly, antioxidant studies in the secondary prevention of coronary heart disease (CHAOS, WACS, and HOPE) show clear evidence of the benefits of antioxidants in reducing new cardiovascular events. Atherosclerosis is a chronic inflammatory disease and immunological mechanisms are of central importance. It is known that oxidized LDL and its oxidized moieties were a major class of immunodominant epitopes within the atherosclerotic plaque. Oxidation of LDL leads to the generation of a variety of oxidized lipids and oxidized lipid-apo-B adducts. UC San Deigo researchers proposed that an immunization strategy could be used to inhibit the progression of atherosclerosis by showing that immunization of rabbits and/or mice (and ultimately humans) with MDA-LDL could inhibit atherosclerosis. To develop a safe vaccine for human use would require the identification of the specific immunogenic oxidation-specific epitope(s) that provides the atheroprotective immunity. Until now, the mechanism of the protection, that is, the immunodominant epitope(s) has not yet been determined. UC San Diego researchers have been able to identify a small group of MDA-derived adducts which are immunodominant and atheroprotective in mice following immunization. The invention described here has the potential to provide an antigen to formulate a wholly synthetic vaccine to inhibit the development of atherosclerosis in man. Furthermore, in vivo levels of the adducts, and the autoantibodies recognizing them, may be used as diagnostic tools in patients with cardiovascular and other inflammatory diseases. Mice have been immunized with the adducts resulting in atheroprotection. Techniques are currently being developed for a totally synthetic immunogen suitable for human clinical studies. Assays are also being developed.